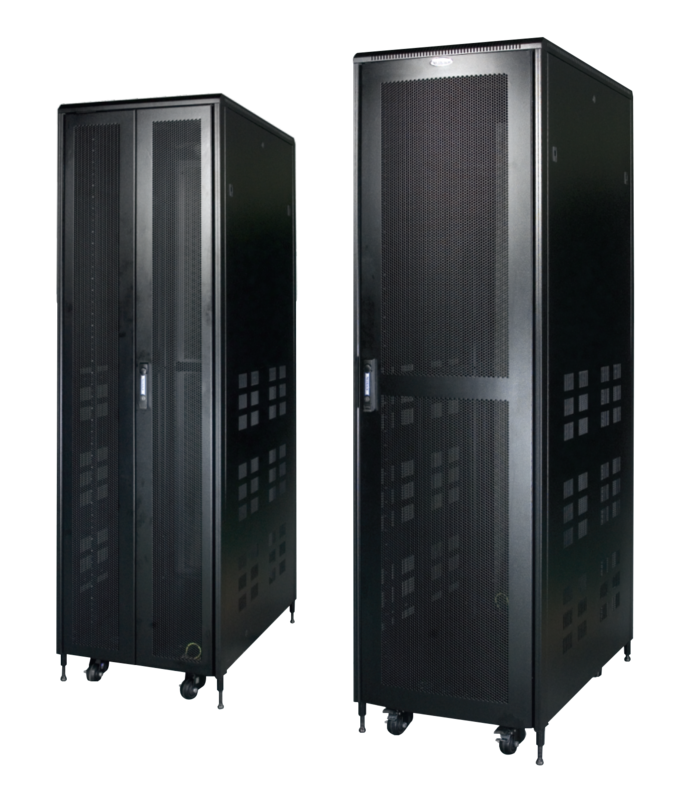 NRA Series Rigid Racks for Severs, Networking, AV, Telecom & lab application. Rocks Manufactured out of aluminium profile, Formed steel frames & members, individually Powder coated and bolted with highest quality standards under stringent ISO 9001-2008 Manufacturing & Quality management system. Standard for Racks configuration will be bolted frame with 4 No. Pillars made of aluminium extruded profile Bolted to top and bottom ribbed/ reinforced frame additionally supported depth wise by 6 no depth rail 2 folded profile. Associated with vented top cover with fan mounting provision. Front Glass or perforated Metal Door with lock & Key and Back Vented / perforated metal door with lock & key and partially vented or plain side panels, 1200 deep rack will be configured with dual side panel. Free standing on floor with 4 No casters wheels with 2 No’s with brakes and 2 No’s without brakes & with Levelers OR plinth. 4 No Adjustable. 19” verticals with Punched 10mm Squarer Hole and Universal 12.7 mm-15.875 mm- 15.875 mm alternating hole pattern offers greater mounting flexibility, maximizes usable mounting space.